Fighting terrorism for the peace and stability of the region, Afghan National Defense and Security Forces (ANDSF) have paid high sacrifices and triggered an outpouring of national grief. Terrorist networks, mainly the Taliban and Daesh militants are widely involved in war crime and violated the humanitarian law. They sought to spill the blood of both combatants and non-combatants without an iota of humanity. Addressing a meeting with the Afghan Army’s 205th Attal Military Corps soldiers and officers in southern Kandahar province the other day, President Mohammad Ashraf Ghani has said he is ready to pay the ultimate sacrifice but would not let the Afghan forces to be dissolved and those thinking so should rethink. “Those who say there is no motivation among the Afghan security forces, they should look at our forces, your patriotism really is appreciable,” he said. The president ordered security and defense organs to resolve problems in equipment supply to soldiers, their privileges and rights. Afghan nation has proven that the warlords and extremists cannot rule them ever. The Taliban, Daesh and those supporting terror should realize the power of young generation of Afghanistan and the country’s security forces. Despite of intensified peace efforts and government’s repeated call upon Taliban to shun violence and join the peace process, the militants continued their militancy campaign against the Afghan nation and the security forces. They have targeted many military bases and martyred dozens of soldiers, who have always been ready to sacrifice their life for dignity and welfare of their countrymen and women. Public support is widely existed for ANDSF. The Afghan soldiers have shown their bravery and gained national honor for the country throughout the history and will do so in the future as well. They must be paid enough heed and the life and dignity of their families should be ensured forever. 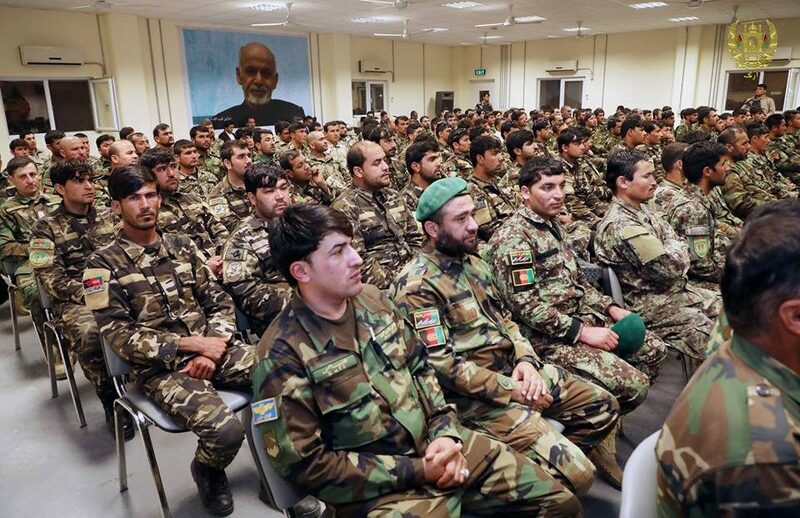 As per president’s remarks, ANDSF has remarkably shown their patriotism to their homeland, in particular when flood hit the southern provinces of the country. Being in front line of war on terror, the Afghan forces also rushed to help their compatriots in flood affected areas and provided them essential facilities through ground and air operations. Afghan forces fight against terrorism is commendable and considering their eye-catching achievements in war against the militants and to campaign against them in effective way,government and the allies should intensify their attacks – not only defensive but also offensive ones. Our soldiers, who fight not only to protect nation’s rights but also to root out radicalism, should be considered the national heroes and heroines. Their bloods shouldn’t go in vein, rather their sacrifice’ should be honored and their families should be provided safe and sound environment.